Since 1983, Closet Factory has defined the art of organization by designing and installing the only truly customized closet and storage solutions in the industry. We take pride in bringing relief to our clients whether that be in their home or office. We live in a world of just too. much. stuff. and it prevents us from being focused on what's most important. 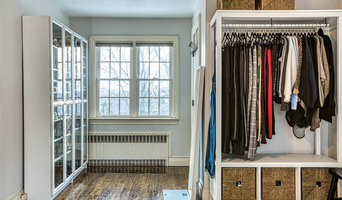 New York Custom closets specialists. A family owned and operated closet company, not a franchise. Closet systems organizers - Design and Installation. We pride ourselves on our service, our integrity, our experienced knowledge in designing customized closets that actually works for your personal use and available space. We design, build, deliver, and install your closet system at no extra cost. Hi, I am Guy with Shop Shelf Guy Inc! Shelf Shop Guy Inc. (SSG) designs, sells and installs a broad range of shelving, storage and cabinetry. We are an exclusive distributor of Rakks shelving hardware systems. With a great attention to detail, we guarantee the highest level of service, premium quality and value. SSG serves the Tri State Area with turnkey solutions that allow for incorporation of custom-cut shelving. Green shelving/cabinet products are also available. Contact us today for your free design consultation and quote! We take pride in bringing relief to our clients whether that be in their home or office (or both!). We live in a world of just too. much. stuff. and it prevents us from being focused on what's most important. What we do at Sort and Sweet is help you declutter the stuff that doesn't bring value to you and create an order to the things that do. In the end, you will have the space and time to spend with your family or thrive in your business and the skills to maintain your new, organized lifestyle. Everyone - and we mean everyone - deserves to live and work in a beautiful and peaceful space. If this is something that has been weighing on your mind, reach out to us today and we'll happily get you started on this path! Professional Home, Business, and Estate Organizer serving Bergen County, NJ and the surrounding areas. Lifestyle Simplifier. When hiring a professional organizer, technical skills are important, but working with someone you like being with is essential. Gayle M. Gruenberg, CPO-CD® is unique among her peers. No other organizer will love you through the process of getting organized like she will. Gayle is gentle, intuitive, and non-judgmental. She brings energy, a fresh perspective, and FUN to her projects. Gayle gets down in the trenches with her clients, really listens to them, and will bend over backward to find organizing solutions that fit their individual styles and preferences. She is experienced in organizing and in life, trained in techniques designed to benefit a wide range of client challenges, and believes that organizing is an inherently spiritual practice. Get to know Gayle! See our video on YouTube: <a rel="nofollow" target="_blank" href="https://www.youtube.com/watch?v=r-Jj7DBB4A4">https://www.youtube.com/watch?v=r-Jj7DBB4A4</a>. ICD designs, supplies, and installs the finest custom storage, closet, bath, mirror, and glass solutions available. We have design consultants located in each of our serviced areas who can help you make your residence feel more like home. Feel free to contact us with any questions you may have about your desired solution, our designs, and products. Innovative Closet Designs is a family owned business and has served the Tri-State area's finest homes and commercial developments since 1985. If your home is in disarray or you need to get clutter under control, it may be time to seek help from a Freeport, NY professional. Professional organizers in Freeport can help you get almost any space back in shape, whether it’s your office, a master closet, the kids’ playroom or the entire house. Before hiring a professional organizer, consider exactly what you need. Have you just moved into a Freeport, NY home and have no idea where to put everything? You may want to consider an organizer who specializes in room-by-room space planning or estate organization. Perhaps you’re faced with a tiny closet and an overflowing wardrobe. In that case find a professional who focuses on closets to help you get back on track. Also consider the types of objects that need organization. Are they items like books, family photos, files or collections? You’ll want a professional organizer who has experience designing custom systems with Freeport, NY companies that will best fit your needs. Find a professional closet and home organizer on Houzz. Narrow your search in the Professionals section on Houzz to Freeport, NY closets and home organization.